They said they have a number of items to examine and have received some new information from the public. Gardaí launched the search almost two weeks ago. GARDAÍ IN CORK have completed a search operation in a woodland area as part of the investigation into the disappearance of Tina Satchwell. The 45-year-old woman has been missing from her home in Youghal, Co Cork since 20 March 2017. She was reported missing four days later by her husband Richard. Earlier this month officers launched a search operation of a 40 acre site at Mitchell’s Wood in Castlemartyr. They said this was based on a key piece of intelligence they had received. “A number of items recovered during the course of this search will now be examined to establish whether they are related to the disappearance of Tina,” gardaí said this morning. They thanked members of the Defence Forces and other specialist services who assisted in the search. They also thanked members of the public who came forward with new information, which they said will now be investigated. The site in Castlemartyr remains closed to the public until further notice. Gardaí have renewed their appeal for anyone who may have information in relation to Tina’s disappearance to contact the incident room at Midleton Garda Station at 021 4621550 or the Garda Confidential Telephone Line 1800 666111. Email “Gardaí complete search of woodland area in Tina Satchwell investigation ”. 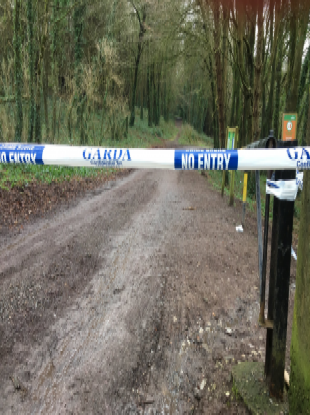 Feedback on “Gardaí complete search of woodland area in Tina Satchwell investigation ”.